I'm still plugging away at this. The fourth big square is finished. and I've made a couple of smaller ones too. I think the challenge with these very square blocks is still how to stop everything looking static and lumpy, so before I put the bits away yesterday I tried moving things around a bit to see what I thought. I don't know that this makes much difference, but it all helps. Right now I am wondering if I can introduce a few more vertical pieces and keep varying the size of my housetop blocks; tomorrow I may have other ideas. Since this is AHIQ week, I want to say thanks to everyone who is joining us in this latest adventure. I have seen some projects here and there over the last month and, as with the Chinese Coins, am fascinated to see how different people go about tackling the theme. It's definitely provided me with some food for thought already. Oh these are such wonderful blocks. I love the soft/bright reds. And genius to vary size and placement. I love where this is going!! Lovely blocks--you are progressing so well on this one. I think moving them around does make a difference! I love watching you work and seeing your quilts evolve along the way. Just keep going!!! Yikes! My second quarter improv quilt is still in a pile! I think I have finally come up with a design so now it is time to execute my plan! I will have to get something started tonight so I can post something tomorrow. I like the way your blocks are coming along. I can see what you mean about adding another element or vertical pieces. Definitely some playing around with different color and/or prints is in order. Isn't it interesting how these ideas are metamorphosing? When you first wrote about two-block quilts I thought of alternate sets. Now so many ways to incorporate them are starting to evolve - from adding them as borders to including them as parts of the first block (as you're doing with the triangles in housetops) to working new blocks into open spaces (as your layout suggests.) So many ideas are running through my brain right now. Wow. Your housetops are starting to remind me of Os which make me wonder where the Xs are. Thanks for starting us off in such fruitful and disparate directions. I really like the little ones! That variety of scale is something I always seem to lean toward. Lots of great ideas here! Very pretty! I like the new layout! Wow, this is really taking shape! And I've been working with that housetop block too, although it looks completely different from your version. I like the different sized blocks - makes everything more interesting. And your last layout looks like a very Modern quilt. You could just go with what you have and add lots of white background and you'd be done! Loving how your floral fabric simply bounces around the blocks! And I'm finding it so interesting following your progress with this! I always like it when you start adding in little bits to the bigger blocks you start with. Thanks for teaching me to not just sew everything together, but to leave room to move elements around. This is so interesting. Pops of color and more subtle energy too. Lots to think about! I do like the addition there of the smaller blocks, wondering just where this is going to go. Uh oh. 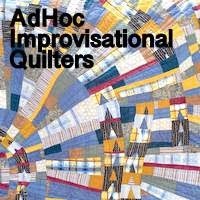 I havae been following Quilty Folk, and now I think I am hooked on AHIQ. Your blocks are so fun. I love the movement. Nice work. I also have a design floor.